I had a few 'loose ends' to pass along on this general topic, so here we go. Perhaps it's become obvious to regular AI readers that I'm a serious Krautrock addict, and it warms my heart to see long lost names reappearing in CD catalogs, 'zines, and store shelves. Similarly, I find a growing number of artists picking up from where the Kosmische pioneers landed in c. 1975, and now blasting off on their own journey. You can read about Mushroom elsewhere in these pages, but there are more every day that join in and contribute their own separate voices. If this continues, perhaps this makeshift column will appear regularly in AI. In addition to the new Faust and Agitation Free releases (see reviews), I've often been spinning "The Genius of Komeda" (Minty Fresh mf-18, 1996), a bizarre quartet from Umeå, Sweden that is simply a hybrid of the syrupy synth-pop of their compatriots Abba with the rhythmic idiosyncrasies of Can (although they obviously mimic Kraftwerk on the album's cover). Can's own "Moonshake" from 'Future Days' is pretty close comparison actually. But it really works for me because of Lena Karlsson's infectious singing and peculiar accent (particularly the way she sings "bay-beee"). I've recently heard a bit of Stereolab also, who seem to be far more widely known for doing this kind of thing, but I highly recommend Komeda for a change of pace that's both intelligent and mindless fun. The best opening act I think I've ever seen appeared before my eyes in Cleveland recently, in the form of six improvisational gurus known collectively as Speaker\Cranker. Jerry and I made the road trip north to catch the latest version of the classic Trilogy Gong, as brilliant and entertaining as usual. But not before the hometown krautrockin' heroes rocked Cleveland's world with an energetic, free-flowin' and edgy set of tunes complete with multiple layers of synths (courtesy of ex-Pere Ubu Jim Jones) and bonus knob-twiddlin' effects. But it was the rhythm section of Jim Donadio (bass) and Scott Pickering (drums) that drove the message home, Neu!-style. Fabulous stuff - I can't get enough. Their debut CD is due any day now, so you'll definitely be hearing more about these guys in AI's to follow. 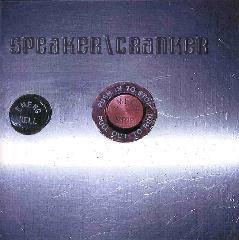 You can visit Speaker\Cranker at their web site. There are also some bands in Germany playing krautrock in recent days...imagine that! Almost by accident, I came across a wonderful disc by the duo called S/T called "The Difficult Second Album," released in 1995 on the obviously indie 'Save Our Sperms' label in Frankfurt, Germany. I don't know anything about these guys other than they go by the names 'Mister Miller' and 'Horse Badorfies' (Nope... that's not a misprint. Anybody know what the hell this means?) and they play a killer style of crazed psychedelia that is only surpassed in insanity level by the Vas Deferens Organization. A couple tunes have a strong Hawkwind resemblance, the sort of electronic freakouts that Dave Brock offered on 'Earthed to the Ground' for instance. But some of this S/T stuff is even better. I am intent on finding out whether there actually was an easier first album made, or perhaps an impossible third. An internet search turned up exactly nothing except the presence of this very album listed in Pat Reilley's catalog (Lone Starfighter). What can you tell me, Pat? In more traditional Krautrock Korners, a Can box set has appeared (I've held it in my hands, but am not wealthy enough at the moment to actually own one) and gotten some positive reviews, though the word is that it could have been done better. Apparently the contents of the accompanying book are printed in three different languages, which is quite redundant to say the least. But portions of the two CD's and especially the video have gotten really high marks. I continue to see hints that the Amon Düül II reunion has come to a quiet end, which is rather sad because they never did make it to the states. So my dream of seeing Hawkwind, Gong, and Amon Düül II might not ever come to pass. And finally, when are we going to see any official Kraan reissues? One lone official CD has appeared, a 14-track compilation of tunes ('Famous Years Compiled') from their long career that is overpriced everywhere I see it. It is still possible to find the original Germanofon bogus reissues of 'Kraan' and 'Wintrup,' but I would hope that these haven't ruined the market for a proper series of reissues. Faust - "Ravvivando" (Klangbad 1999, frav 199) Well, I had heard about this new Faust CD but didn't give it much thought, figuring that it could hardly match the inventive genius of the original four classic albums of the mid-1970's (Faust, So Far, Tapes, and IV). Also, I imagined that perhaps only one or two members would still be hanging on to 'a shell of a name.' I had seen unfavorable reviews of their 1996 release 'Rien' (somewhat better ones for 'Nosferatu'), but remained dubious that whoever was left still had anything important to say. But when I saw it staring me in the face in a record store (not your local NRM mind you), I got the impression from the high-quality packaging alone (an orange-colored digipack) that this was a serious attempt at a 'rebirth.' It was only later I learned that 'Ravvivando' is a term (Italian I think) that means revived or strengthened. The album's high points are the longer pseudo-industrial romps like "Wir brauchen dich #6" and "Apokalypse," both featuring excellent guitar bits (fuzzed out and otherwise treated) from Steven Wray Lodbell. It gets kinda crazy when the feedback kicks in, but it's really psychedelic and only mildly dissonant. Guest vocalist Ulrike Helmholz provides some colorful chant-like parts to "Take Care" and some poetic readings (in German) during "Du weißt schon." The low points are few and far between, and the album finishes strong with the droney and 'pained' "Livin' Tokyo" and the pulsating "t-électronique" emulating the Harvey Bainbridge style of keyboard programming. Michael Stoll's active bassline and Diermaier's hollow-snare drumming also serve to make this tune shine extra brightly. The strongest attribute that Faust seem to possess is a lack of any outstanding playing abilities. Hence, the need to be singularly creative in the formulation of their music. It so often works this way... lousy baseball players often become the best managers. And here on 'Ravvivando,' Faust has once again turned the music world upside down on its head, and so the old dog has taught the young dogs (i.e., the new 'industrialists') another trick. A really pleasant surprise...highly recommended. There is an informative Faust web site at http://195.92.248.101:802/faust/. It's pretty much a set rule with me that anything German, obscure, and recorded between 1970 and 1973 is brilliant. (Not entirely true, but darn close.) By 1974 though, a number of krautrock bands started puzzling trends, sprialling outwards into other genres of music, the results often being entirely fruitless. In the case of Agitation Free, it just seemed as though the band abruptly vanished into thin air following their outstanding succession of studio and live albums (now numbering five), culminating with the February, 1974 recording that was recently released (also on Garden of Delights) under the name 'At The Cliffs Of River Rhine.' However, we now learn that bassist Michael Günther and guitarist Gustl Lütjens did carry on with a hodge-podge lineup of friends, eventually changing their name to Lagoona as they'd fallen below 'critical mass' in original members. The album they recorded in late 1974, what has basically been dusted off and presented here for the very first time, was rejected by their label and the band managed only to complete a brief tour of Denmark before calling it quits for good (or at least until this year, with the release of 'River of Return' imminent). As Lüül Ulbrich (in France with Nico at the time of this recording) noted in the interview in AI#6, this should not be considered a 'proper Agitation Free recording.' I fully agree. There is virtually nothing in common between the style of the cosmic-jamming 'river Rhine' album and 'Other Sides.' From note 1 of "Atlantic Overcrossing," penned and sung by Metropolis keyboardist Manfred Opitz, you quickly discover that this stuff has more in common with the cheery soulful jazz of Steely Dan or Blood, Sweat, and Tears than Kosmische *anything*. And whereas there is no reason to believe that the addition of sax (Klaus Henrichs) couldn't work well with true Agitation Free music, here the playing style is that of David Sanborn, not Nik Turner. (You decide if that's good or bad.) There are several more recording sessions presented (various lineups) with most of it falling along similar lines, sometimes with a touch of Caribbean flair, and even a dose of trombone (guest Lou Blackburn) atop the funky jazz groove of "6th Floor." On two lone tracks, there is a detectable flavor of the earlier AF-style. On both "Deliverance" and "Offstage," the recognizable pattern is the combination of the active and repeating bassline of Günther combined with the fluid guitar soloing of Lütjens used as melody. Even still, the imagery that is conjured up is TV shows of the 1970s like 'The Love Boat' and definitely not '2001: A Space Odyssey!' It's amazing to learn how much can be done to change the perception of music simply in the studio production/recording stage, since only slight changes in instrumentation and composition style are apparent here. Hence, I think the base elements of many of these tracks could be easily reworked into tracks quite similar to what Agitation Free presented earlier in the same year. In fact, this discovery alone is more interesting to me than the music itself. Beyond the seven 'band' tracks, the final three-part piece is yet different, a portion of Alfred Bergmann's radio play "Störenfried" that Günther helped co-write. The 10-minute piece is entitled "Song für die Proletariersohn" and is easily the most musically interesting portion of "Other Sides." Early Agitation Free member and later Ash Ra Tempel vocalist Mickey Duwe contributes both the narration and sung vocals (in German, of course). What sets this material apart is that there is some tension present in the performance...i.e., it actually sounds like krautrock here. For me, a loyal AF disciple, this final piece (and the informative booklet including a detailed history and lots of photos) alone make the album worth having, but "Other Sides" is in no way a proper outlet for discovering Agitation Free as the great band they were. Because it really isn't that band at all. Overall, I find it hard to really judge this music against what little I know of comparable artists, so all I can tell you is that it sounds dated. And as such, mainly an item of historical significance only...not at all like the perfectly-aged vintage of 'river Rhine 1974.' You can visit Agitation Free at their web site.